Due to poplular demand for an even larger All Natural Series cutting board made from one solid piece of wood (zero glues) we bring you the Simplicity XL PLUS. 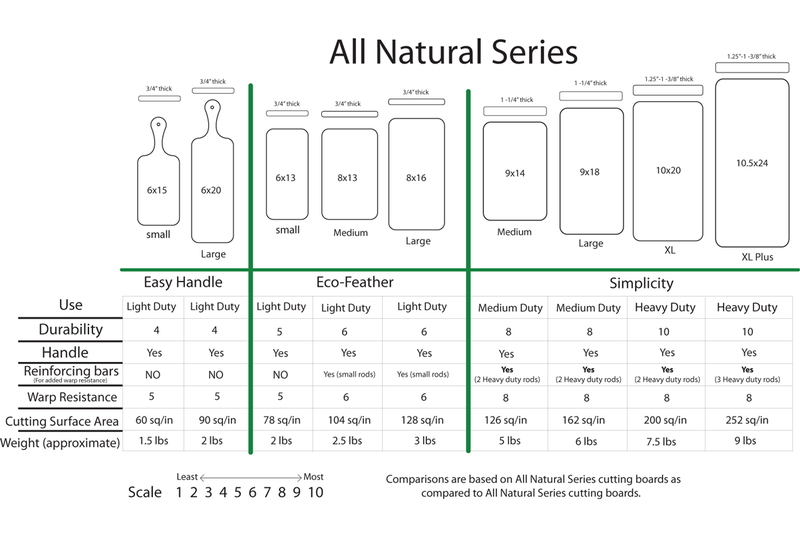 Our All Natural Simplicity Series Line of cutting boards, perfect for all of your medium to heavy duty cutting needs. It is approximately 10- 10.5"" Deep x 24" Wide x (1.25"-1 3/8") thick. (Sizes can vary slightly +-1/4"-3/8" as each of these are custom made from one piece of wood) This is the perfect sized board for someone who cooks large meals for large families, or likes a lot of room to work. The XL PLUS is approximately 250 square inches of cutting surface. Compared to our already substantial All Natural Series XL it has 20 % more cutting surface (XL has 200 squ/in XL PLUS is 250 square inches of cutting surface). The XL PLUS will have limited availability only as lumber is available, and is only available on Urthware.com, so if you see it on our site and would like one, remember, it may not be up on our site the next time you visit so buy them when you see them. These boards are re-enforced with three high grade stainless steel heavy duty rods in the middle of the board to help stabilize the wood, reducing the chance of wood movement (warping). It is hand made with care 100% in Canada using one solid piece of Canadian Hard Maple (no glue) which is sourced within 100 miles of our facility, and uses other all natural, and completely non-toxic materials. Our cutting boards have two finish coats of our own all natural Certified Organic Flax Seed Oil, our Certified organic Walnut oil, or our Certified Organic Coconut Oil as their main finish and added Certified Organic Canadian Beeswax, and Certified Organic Carnauba Wax to add waterproofing and durability! NOT A MINERAL OIL FINISH like other cutting boards and wooden kitchen products, as mineral oil is a petroleum based product. -Absolutely NO petroleum or synthetic finishes, only truly organic, natural, nature made finishes. -A tree is planted for every Urthware board sold to offset our footprint. *We are not a Tree nut/Nut free facility. We also use Walnut wood. *All cutting boards (regardless of finish chosen) use organic flax oil and Carnauba wax to fill imperfections as well as to water seal the feet and re-enforcing bars.